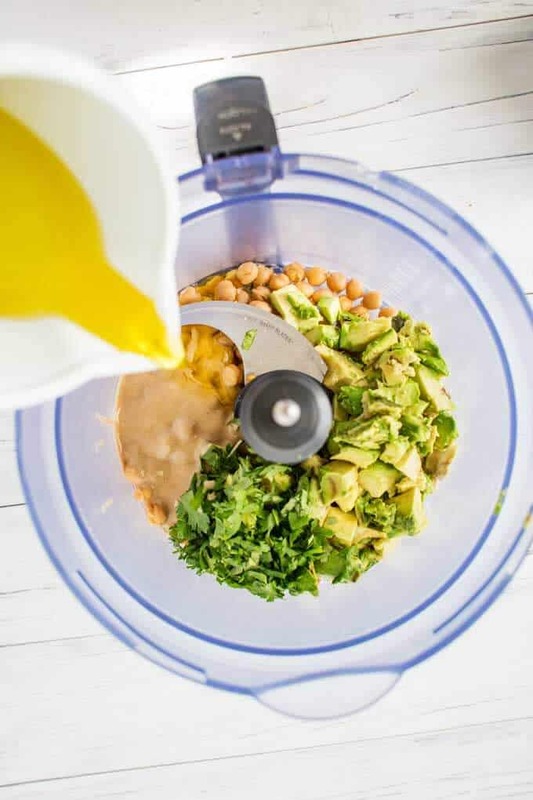 This healthy avocado hummus with tahini is a delicious and nutritious way to change up your hummus game. It is a fabulous snack and also makes a great spread for sandwiches and wraps. Gluten Free and Vegan. We all have go-to foods that we couldn’t live without. For me, hummus is one of them. It doesn’t matter what the flavor – roasted red pepper, pine nut, you name it – I absolutely adore it. I eat it with veggies and crackers for a snack. I put it on wraps and sandwiches. I’ve even been known to add a dollop or two to a salad to add in some protein and healthy fats. You know another food I adore? Avocados. Very few days go by without me eating at least 1/2 of an avocado. Today’s recipe combines two of my favorites into one incredible dip. Allow me to introduce you to your new snacking BFF: Avocado Hummus. If You have never made hummus at home before – don’t worry. It is so simple even my boys can make it. 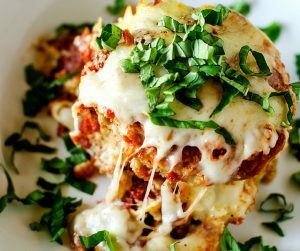 This healthy recipe comes together in a matter of minutes, and is so delicious! 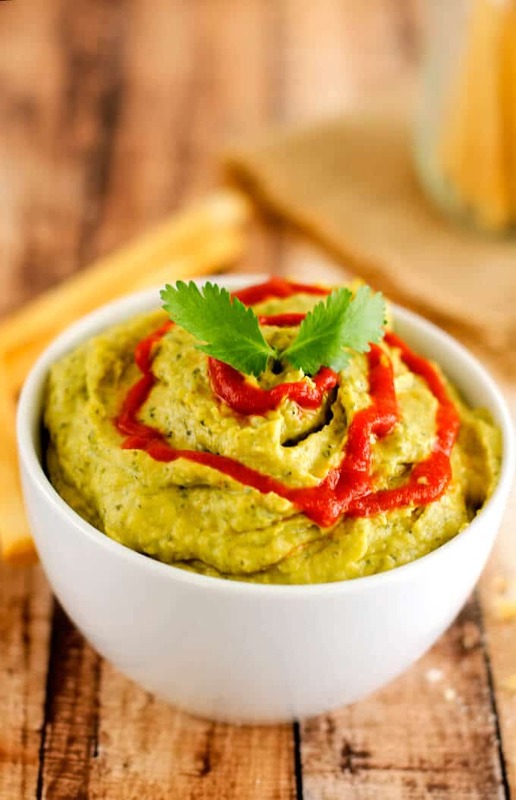 With cilantro, garlic and a hint of kick from chipotle chili powder, this hummus recipe will become a regular in your snacking rotation. Make sure you don’t skimp on the lemon juice as that is what will keep the dip from browning. I also recommend storing this with plastic wrap directly on the hummus the same way that you would guacamole. That is, if there is any left to store. What are foods that you couldn’t live without? 1 How Do You Make Avocado Hummus? 2.3 Serve with crackers, pita chips, or pretzels. How Do You Make Avocado Hummus? Making Avocado Hummus couldn’t be easier! 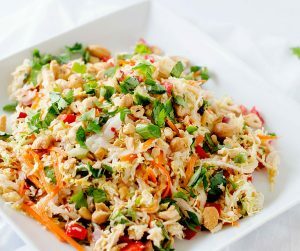 Serve immediately or store in a covered dish in the refrigerator for up to two days. It is best to place plastic wrap directly on top of the hummus to prevent browning. Can I Make Hummus without Tahini? Yes! The taste will be different, but still delicious! Try substituting Greek Yogurt or nut butter. Yes! Here are some important nutritional benefits of this avocado hummus. In addition to being high in protein and fiber, chickpeas are an excellent source of zinc. Zinc helps to regulate moods and can help your brain to function well. It has also been shown in studies to help reduce feelings of depression. 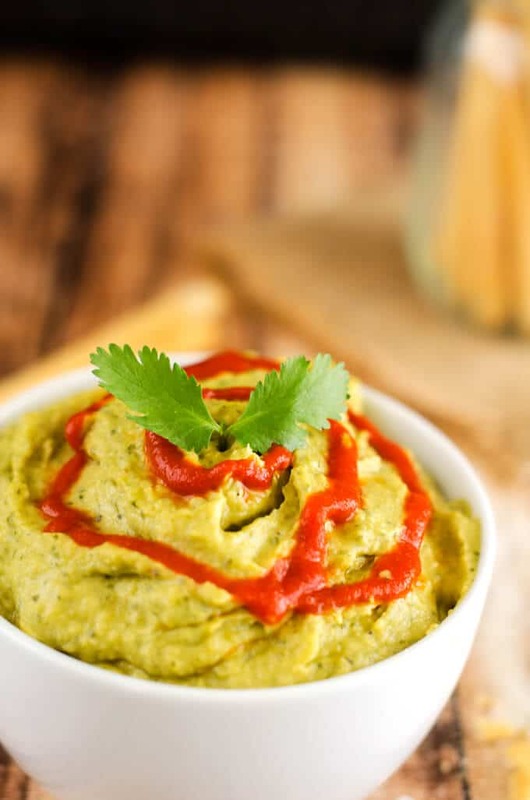 Since zinc isn’t very accessible in the body, the addition of garlic helps to make this avocado hummus even healthier! Garlic contains sulfur which can help your body better absorb zinc from food. While it is true that avocados are high in fat, the fat is mostly monounsaturated. This type of fact has been shown to decrease cholesterol levels. Avocado is a good source of potassium and folate, which can help to keep blood pressure levels in check. According to a study in Food & Function, avocado may help to negate the effects of eating inflammatory foods. Olive Oil is another source of “good fat”, and has been shown to support brain health. The antioxidants are believed to help with learning and memory. 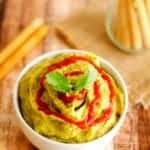 This healthy avocado hummus with tahini is a delicious and nutritious way to change up your hummus. Gluten Free and Vegan. 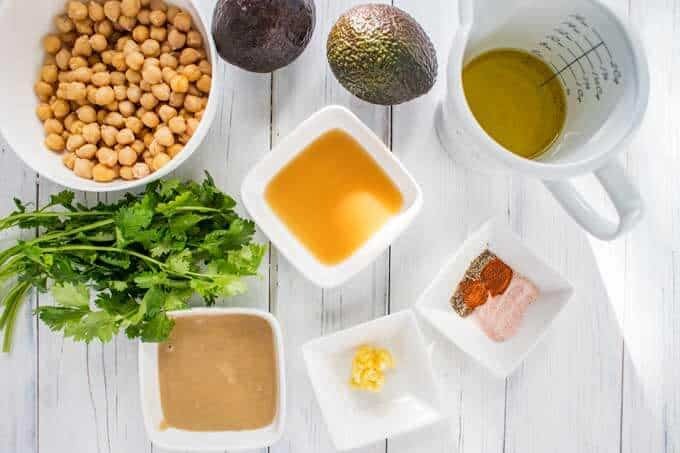 Place avocados, chickpeas, cilantro, garlic, lemon juice, tahini, water, olive oil, sea salt, black pepper and chipotle chili powder in a blender. If the hummus is thicker than you would like, add additional water until the desired consistency is reached. If you don't have or just don't like tahini, feel free to leave it off. Reduce the water by half initially and add until desired consistency is reached. The avocado adds all of the creaminess that you need. In place of the chickpeas, substitute two peeled and chopped zucchini. This recipe already has a little kick, but if you want it to be hotter add in 1/4 cup pickled jalapeños. You may also want to double the chipotle chili powder. For a fun twist, use lime juice instead of lemon juice and add in 1 teaspoon each of ground cumin, chili powder, and smoked paprika. Serve with crackers, pita chips, or pretzels. Serve with vegetables. Carrot chips or sticks, celery, red pepper and cauliflower are all great options. This hummus is amazing as a spread in wraps. While you can certainly use canned chickpeas, I much prefer to use chickpeas cooked at home. There is just no comparison in taste! Home cooked chickpeas beat canned chickpeas every time. I like to cook them in vegetable broth using my instant pot. Another option - bribe your kids to help you remove the skins from the cooked garbanzo beans for the smoothest hummus possible. I don't do this every time I make hummus, but if I have a little extra time it is worth the effort. For optimum flavor, allow the hummus to sit in the fridge for 30 minutes prior to serving to give the flavors a chance to settle in. I am a self-admitted hummus addict and this looks so good!